Confession: Besides the fact that I’m a vegan who drinks Guinness (and other non-vegetarian beer, wine, and liquor), I also hate salad. Seriously. I abhor it. Sure, I’ll choke it down when I have to, and I’ve been known to survive on mostly salad when in South Georgia where the concept of non-meat-infused vegetables is foreign, but I really really hate it. Salad dressing has never cried out to me, lettuce gives me the shakes, and raw veggies just don’t turn me on. In my meat eating days, I could be convinced to eat a chicken Caesar salad…but since Caesar salad dressing isn’t vegetarian I’ve had to swear off of that (and I’ve been too lazy to make V’Con’s recipe). Which left me with Italian vinaigrette or some other bland form of lettuce enhancer. The day I met Soul Veg’s house salad dressing, everything changed. Radically different than anything I’d had before, their tahini, lemony, misoey, I have no idea what is in it awesomeness was so delicious that I wanted a salad. I wanted a big salad! I wanted lettuce and sprouts and whatever else comes on salads! (Well, minus cucumbers. Shudder.) Recreating their dressing has proved problematic, however, and even though I said the tahini dressing was good, I gave it to the poet, because, really, it wasn’t my cup of tea. When Ricki of Diet, Dessert, and Dogs posted her anti-candida bowls of love yesterday, the sauces called out to me. They cried make me, put me on that hunk of romaine lettuce you have sitting in your fridge, slurp me up with croûtons and greens, cherish me! Ok, well maybe not that tahinily, but every single recipe looks killer. Thus the Tahini-Miso Salad Dressing Sauce was born at 4:15 pm today in my blender. I followed the directions exactly, no substitutions, and the result was out-of-this-world. Sweet and tangy, with a ginger bite, this sauce is the perfect addition to any tofu, tempeh, bowl of grain, salad, whatever you want to put dressing on. To point out how good it is, I just licked my bowl clean. For reals. Ricki calls it “light and tangy,” but I simply call it damn good. I mean, it made me like a salad! Ricki, you might have just made my life a little more delicious and a lot more healthy! So thank you Ricki for saving my salad-less lifestyle, and thank you head of romaine lettuce for staying fresh in my crisper. Personally, I can’t wait to try the Orange Fig Sauce next! Combine all ingredients in a blender and whir until smooth. Your excellent review of this recipe leaves me hungry. I am making this tonight! Thanks for sharing. i love the combo of tahini and miso. this dressing is good on literally any veggies. seriously try the v-con ceasar it’s a big staple in my house, my bf stopped eating soy for a year and started again because he tried my salad hehe it’s really worth it! Wow, Jes, I am thrilled that you liked it so much! I have to admit that I was never much of a salad person, either. But something about the combination of the veggies with grains and nuts, seeds, etc. really makes it work for me. I think you’ll like the fig sauce, too–I had some left over and just baked some slabs of tofu in it like a marinade, and it was great. 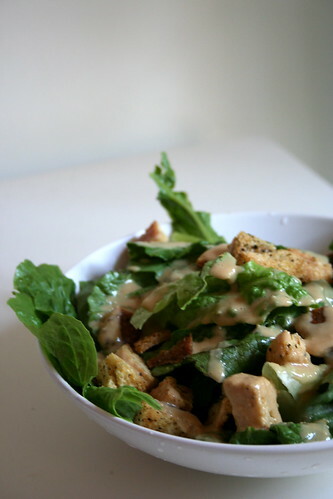 Oh–and you really SHOULD try that V’con Caesar dressing–it’s fabulous! The dressing definitely sounds like one I’d use not just on salads, but on everything I eat! Pretty picture, too! Wow, when I read this I know EXACTLY what you mean, I am not a salad lover at all, I choke them down because they are healthy and low calorie, don’t like raw veggies very much as well. I look forward to trying these recipes, thanks for coming out of the “salad hating closet”!! HAHA! Would you believe me if I told you that after reading your post I immediately jumped up and made this dressing? Really truly did. You’re so right..it’s delicious..I am imagining it over a bowl of brown rice with veggies..yum..let us know about the orange fig!! That just might be the most pretty salad ever. I used to hate salads too, and I think it was after I graduated from college that I ate my first one. A decade later, I love salad. Hooray for you and your salad!!!! dude. that dressing sounds completely amazing. i have a hard time making my own dressings (they always turn out too acidic and burn my mouth up), and i have a full shelf in my fridge door full of dressings that i hate. because i think i’ll like them, and then i don’t. and i can only eat so much of annie’s goddess crack dressing before i realize that it’s really not that good for me. so thank you for bringing my attention to something that will most likely be fricking rad on a salad. warmer weather is on its way! get out ‘n enjoy it, and have a rock’n weekend! superw00t! Oh, that -does- look good! I’ve been trying to work more miso into my diet lately, so I’ll have to try this dressing. I have always been a huge fan of raw veggies, but hated dressings until I was in my late teens. I’m so glad you finally found a salad dressing you like – I’m sure your colon is, too! Ha! This post made me laugh. I love salad, but my husband hates it. The only place he will eat salad is at Soul V because of their tasty Prince Dressing. We had some friends get married last year and Soul V catered it… we got to bring home the leftover vat of dressing. Mmm…. it’s so good! ha! I thought I was the only vegan in the world who drinks Guinness and doesn’t like salad O_O ! Once you find the right dressing, the salad is relegated to its appropriate station in the world: vehicle for flavor. I am drooling looking at these!